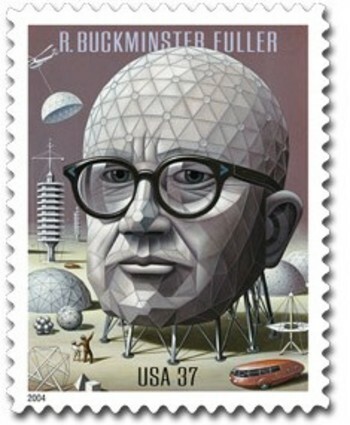 Richard Buckminster “Bucky” Fuller (July 12, 1895 – July 1, 1983) was an American visionary, designer, architect, poet, author, and inventor. Throughout his life, Fuller was concerned with the question "Does humanity have a chance to survive lastingly and successfully on planet Earth, and if so, how?" Considering himself an average individual without special monetary means or academic degree, he chose to devote his life to this question, trying to find out what an individual like him could do to improve humanity's condition that large organizations, governments, or private enterprises inherently could not do. Pursuing this lifelong experiment, Fuller wrote more than thirty books, coining and popularizing terms such as "spaceship earth", ephemeralization, and synergetics. 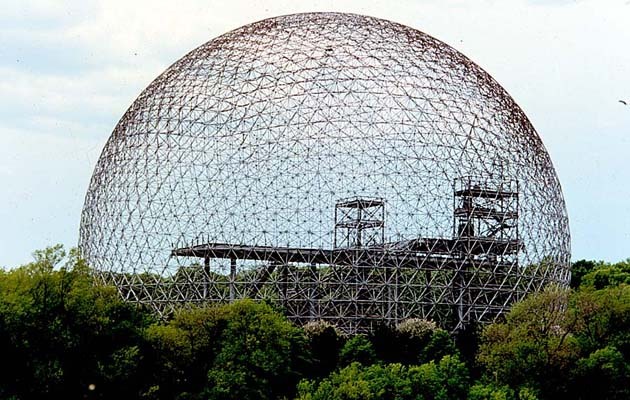 He also worked in the development of numerous inventions, chiefly in the fields of design and architecture, the best known of which is the geodesic dome. Carbon molecules known as fullerenes or buckyballs were named for their resemblance to a geodesic sphere. Late in his life, after working on his concepts for several decades, Fuller had achieved considerable public visibility. He traveled the world giving lectures, and received numerous honorary doctorates. Most of his inventions, however, never made it into production, and he was strongly criticized in most fields he tried to influence such as architecture, or simply dismissed as a hopeless utopian. Fuller's proponents, on the other hand, claim that his work has not yet received the attention that it deserves. According to philosopher N.J.Slabbert, Fuller has an obscure writing style which has impeded the circulation of his ideas. 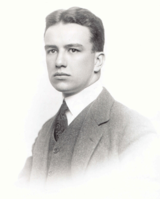 Fuller was born on July 12, 1895 in Milton, Massachusetts, the son of Richard Buckminster Fuller and Caroline Wolcott Andrews, and also the grandnephew of the American Transcendentalist Margaret Fuller. He attended Froebelian Kindergarten. Spending his youth on Bear Island off the coast of Maine, he was a boy with a natural propensity for design and for making things. He often made things from materials he brought home from the woods, and sometimes made his own tools. He experimented with designing a new apparatus for human propulsion of small boats. Years later he decided that this sort of experience had provided him not only an interest in design, but a habit of being fully familiar and knowledgeable about the materials that his later projects would require. Fuller earned a machinist's certification, and knew how to use the press brake, stretch press, and other tools and equipment used in the sheet metal trade. Between his sessions at Harvard, he worked in Canada as a mechanic in a textile mill, and later as a laborer in the meat packing industry. He married Anne Hewlett in 1917, and also served in the U.S. Navy in World War I as a shipboard radio operator, as an editor of a publication, and as a crash-boat commander. After discharge, he again worked in meat packing, where he acquired management experience. In the early 1920s he and his father-in-law developed the Stockade Building System for producing light weight, weatherproof, and fireproof housing — though ultimately the company failed. In 1927 at the age of 32, bankrupt and jobless, living in inferior housing in Chicago, Illinois, Fuller lost his young daughter Alexandra to complications from polio and spinal meningitis. He felt responsible, and this drove him to drink and to the verge of suicide. At the last moment he decided instead to embark on "an experiment, to find what a single individual can contribute to changing the world and benefiting all humanity." Fuller accepted a position at a small college in North Carolina, Black Mountain College. There, with the support of a group of professors and students, he began work on the project that would make him famous and revolutionize the field of engineering, the geodesic dome. 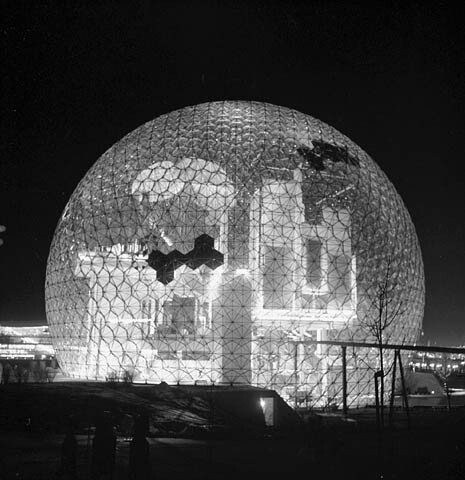 In 1949, he erected the world’s first geodesic dome building that could sustain its own weight with no practical limits. It was a 14-foot diameter dome constructed with aluminum aircraft tubing and a vinyl-plastic skin in the form of a tetrahedron. To prove his design, Bucky and several students who helped build it hung from the structure’s framework to awe non-believers. The U.S. government recognized the importance of the discovery and employed him to make small domes for the army. Within a few years there were thousands of these domes around the world. For the next half-century Fuller contributed a wide range of ideas, designs and inventions to the world, particularly in the areas of practical, inexpensive shelter and transportation. He documented his life, philosophy and ideas scrupulously in a daily diary (later called the Dymaxion Chronofile) and in twenty-eight publications. Fuller financed some of his experiments with inherited funds, sometimes augmented by funds invested by his collaborators, one example being the Dymaxion Car project. 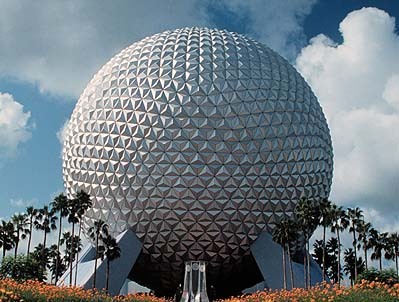 International recognition came with the success of his huge geodesic domes in the 1950s. Fuller taught at Washington University in St. Louis in 1955 where he met James Fitzgibbon a close friend and colleague. Fuller taught from 1959 at Southern Illinois University Carbondale as an assistant professor, receiving full professorship in 1968 in the School of Art and Design through 1970. Working as a designer, scientist, developer, and writer, for many years he lectured around the world on design. Fuller collaborated at SIU with the designer John McHale. In 1965 Fuller inaugurated the World Design Science Decade (1965 to 1975) at the meeting of the International Union of Architects in Paris, that was in his own words devoted to "applying the principles of science to solving the problems of humanity." Fuller believed human societies would soon rely mainly on renewable sources of energy, such as solar- and wind-derived electricity. He hoped for an age of "omni-successful education and sustenance of all humanity." Fuller was awarded 28 US patents  and many honorary doctorates. On January 16, 1970 Fuller received the Gold Medal award from the American Institute of Architects and also received numerous other awards. He died on July 1, 1983 at the age of 87, a guru of the design, architecture, and 'alternative' communities such as Drop City, the experimental artists community to whom he awarded the 1966 "Dymaxion Award" for "poetically economic" domed living structures. His wife was comatose and dying of cancer and while visiting her in the hospital he exclaimed at one point: "She is squeezing my hand!". He then stood up, suffered a heart attack and died an hour later. His wife died 36 hours later. He is buried in Mount Auburn Cemetery near Boston, Massachusetts. Buckminster Fuller was an early environmental activist. He was very aware of the finite resources the planet has to offer, and promoted a principle that he termed "ephemeralization"—which in essence, according to futurist and Fuller disciple Stewart Brand, Fuller coined to mean "doing more with less." Resources and waste material from cruder products could be recycled into making higher value products, increasing the efficiency of the entire process. Fuller also introduced synergetics, a metaphoric language for communicating experiences using geometric concepts, long before the term synergy became popular. Fuller was one of the first to propagate a systemic worldview and explored principles of energy and material efficiency in the fields of architecture, engineering and design. He cited Francois de Chardenedes' view that petroleum, from the standpoint of its replacement cost out of our current energy "budget", essentially the incoming solar flux, had cost nature "over a million dollars" per U.S. gallon (US$300,000/L) to produce. From this point of view its use as a transportation fuel by people commuting to work represents a huge net loss compared to their earnings. Fuller was concerned about sustainability and about human survival under the existing socio-economic system, yet optimistic about humanity's future. Defining wealth in terms of knowledge, as the "technological ability to protect, nurture, support, and accommodate all growth needs of life", his analysis of the condition of "Spaceship Earth" led him to conclude that at a certain point in the 1970s humanity had crossed an unprecedented watershed. Fuller was convinced that the accumulation of relevant knowledge, combined with the quantities of key recyclable resources that had already been extracted from the earth, had reached a critical level, such that competition for necessities was no longer necessary. Cooperation had become the optimum survival strategy. "Selfishness", he declared, "is unnecessary and...unrationalizable...War is obsolete..."
Fuller also claimed that the natural analytic geometry of the universe was based on arrays of tetrahedra. He developed this in several ways, from the close-packing of spheres and the number of compressive or tensile members required to stabilize an object in space. Some confirming results were that the strongest possible homogeneous truss is cyclically tetrahedral. Previously, Fuller had designed and built prototypes of what he hoped would be a safer, aerodynamic Dymaxion car ("Dymaxion" is contracted from DYnamic MAXimum tensION, however it has also been reported that the name is a combination of the words dynamic, maximum, and ion, per the National Automobile Museum.). To this end he experimented with a radical new approach. He worked with professional colleagues over a period of three years, beginning in 1932. Based on a design idea Fuller had derived from designs of aircraft, the three prototype cars were all quite different from anything on the market. For one thing, each of these vehicles had three, not four, wheels — with two (the drive wheels) in front, and the third, rear wheel being the one that was steered. The engine was located in the rear. Both the chassis and the body were original designs. The aerodynamic, somewhat tear-shaped body (which in one of the prototypes was about 18 feet long), was large enough to seat 11 people. It somehow resembled a melding of a light aircraft (without wings) and a Volkswagen van of 1950s vintage. The car was essentially a mini-bus in each of its three trial incarnations, and its concept long predated the Volkswagen Type 2 mini-bus conceived in 1947 by Ben Pon. Despite its length, and due to its three-wheel design, the Dymaxion Car turned on a small radius and parked in a tight space quite nicely. The prototypes were efficient in fuel consumption for their day. Fuller poured a great deal of his own money (inherited from his mother) into the project, in addition to the funds put in by one of his professional collaborators. An industrial investor was also keenly interested in the unprecedented concept. Fuller anticipated the car could travel on an open highway safely at up to about 100 miles per hour (160 km/h); however, due to some concept oversights, the prototypes proved to be unruly over the speed of 50 mph (80 km/h), and difficult to steer properly. Research came to an end after one of the prototypes was involved in a collision resulting in a fatality. In 1943, industrialist Henry J. Kaiser asked Fuller to develop a prototype for a smaller car, and Fuller designed a five-seater; the car never went into the development or production stages. Another of Fuller's ideas was the alternative-projection Dymaxion map. This was designed to show the Earth's continents with minimum distortion when projected or printed on a flat surface. Fuller's energy-efficient and low-cost Dymaxion House garnered much interest, but has never gone into production. Here the term "Dymaxion" is used in effect to signify a "radically strong and light tensegrity structure". One of Fuller's Dymaxion Houses is on display as a permanent exhibit at The Henry Ford in Dearborn, Michigan. Designed and developed in the mid 1940s, this prototype is a round structure (not a dome) shaped something like the flattened "bell" of certain jellyfish. It has several other innovative features, including revolving dresser drawers, and a fine-mist shower that reduces water consumption. According to Fuller biographer Steve Crooks, the house was designed to be delivered in two cylindrical packages, with interior color panels available at local dealers' premises. A circular structure at the top of the house was designed to rotate around a central mast to take advantage of natural winds for cooling and air circulation. Conceived nearly two decades before, and developed in Wichita, Kansas, the house was designed to be lightweight and adapted to windy climes. It was to be inexpensive to produce and purchase, and easily assembled. It was to be produced using factories, trained workers, and technologies that had produced World War II aircraft. "Ultramodern"-looking, it was structured of metal and sheathed in polished aluminum, and the basic model enclosed 1000 square feet (90 m²) of floor area. Due to high-level publicity, there were very many orders in the early Post-War years; however, the company that Fuller and others had formed to produce the houses failed due to internal management problems. ^ Encyclopædia Britannica. (2007). Fuller, R Buckminster. Encyclopædia Britannica Online. Retrieved on 2007-04-20. ^ Fuller, R. Buckminster (1981). Critical Path. New York: St. Martin's Griffin, p. 124. ISBN 0312174918. ^ Slabbert, N. J. (Feb. 2007). Richard Buckminster Fuller's Plea for Comprehensive Design. Washington DC: Urban Land magazine. ^ Pawley, Martin (1991). 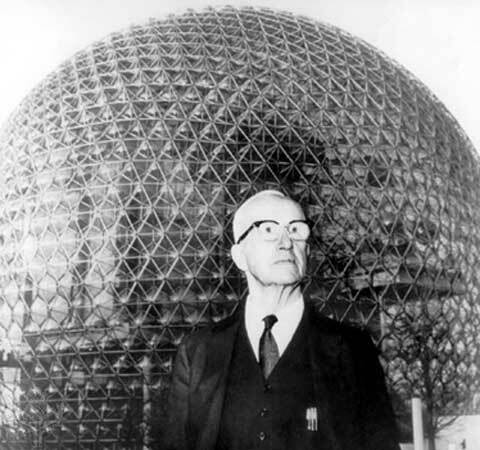 Buckminster Fuller. New York: Taplinger. ISBN 0-8008-1116-X. ^ Fuller, R. Buckminster (1981). Critical Path. New York: St. Martin's Press, pp. xxxiv-xxxv. ISBN 0312174888.